This time of year gets so busy! And we all start to fall off the workout wagon a little bit as we adjust to weather, timing, holiday parties and everything else. But working out is still important, and is a huge help in battling stress. It's something that I still consider a necessity even if time is short. 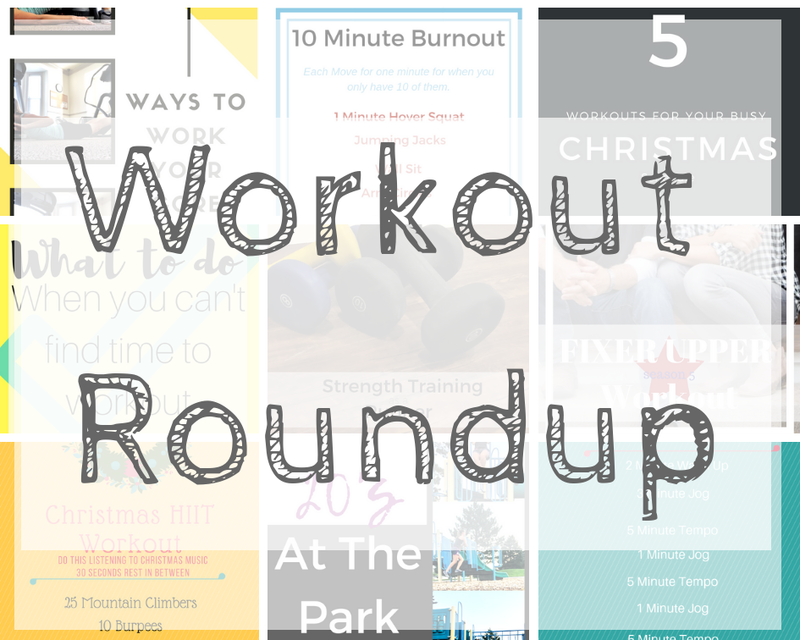 So today I'm sharing a round up of so many different at home workouts that you can try even if you feel like you don't have time to do a workout. All you need is a half hour or less! First though, Anything on my Aaptiv app! Seriously, they have everything! You can pick from any kind of workout, length of workout, level of workout etc. They make it so easy and the trainers are so amazing. You can filter the workouts down by time so you know you'll be able to find one that fits in the amount of time you actually have to work out and not have to cut it short. I can't say enough good things about Aaptiv! Check them out HERE. Here's one to do at home with a set of dumbbells! This one has one move with a kettle ball but other than that it's all body work! It's easy to do at home and it would be easy to adjust if you don't have a kettle ball at home. Here's a Quick and Efficient Full Body Kettlebell Workout. If you're the competitive sort, this one is fun to do with friends, family or to compete with yourself. These next workouts are some that require no gym pass and no equipment, just you and some room around you. Time is no excuse with this 8 minute Holiday Hustle. My Anytime Workout can fit into your day any time and pretty much anywhere. Core Work is important for any athlete and this workout will help you gain a strong core. Who doesn't love fixer-upper? watch some reruns of Chip and Jo while you do this Fixer Upper Workout. Here are some Basic Running Workouts that every runner should give a try. Let your holiday spirit show (and help entertain your kids during Christmas break) with these 5 Christmas Themed Workouts. Strength Training as a runner is important to keep yourself strong and healthy. This post talks about some of my favorite things I use for my strength training and one of my go-to workouts for it. Too busy to workout is not an excuse anymore. Here are 3 Workouts for Your Busy Schedule . Workout while your kids play doing 20's at the park. Include your kids by doing these things that aren't workouts, but that will give you a different kind of workout in the end! If you want to do quick workouts but are unsure what to even do or how to do it, I suggest following these amazing people on Instagram. Kayla Hall @bodyremix is awesome! She's such a powerhouse and a certified trainer. She posts daily workouts on her instastories which makes it super easy to know what moves to do and what your form is supposed to look like. Kaite Later @katielater_fitness. She is a mom of 4 and she's so cute and fun to interact with. Plus she has amazing arms! She posts lots of stuff on fitness. Amanda Brooks @runtothefinish is a running guru! She has so many helpful posts and tips about running and fitness. She also does challenges to help you out! Monica @runeatrepeat is probably one of my favorite Instagram friends! She shares so many fun and random things about life and running on her Instagram. She also has a great blog! Definitely check her out! And, of course, you can always follow me there too! I hope you all have a fantastic Thanksgiving! I am so thankful for all of you and thankful for the friendships I've made through this blog and through social media. Do you find it harder to workout during the holidays? What is the thing that affects your fitness the most during the holidays? awesome roundup - am bookmarking! in fact I don't do much this time of year. So I just keep on keeping on. This is so useful - THANK YOU! As the weather gets colder/more snowy, it's nice to have home workout options to pick from. Love this roundup of home workout ideas! During the holiday season, its hard to get to the gym, so this helpful!! Working out during the holidays is always so tough for me. Taking a walk after a heavy meal is always my favorite way of handling the holidays!